Children can become angered easily and often and most of the time this is normal and part of growing up. However, in a few instances this anger can grow to large proportions and can be detrimental to development, family life, school years and social awareness. In these cases, it may be appropriate top think about anger management classes during which the child learns why they are getting angry, what triggers their anger and how to manage it more effectively. What do the Classes Do? Anger management classes for children are very useful if they are needed. They aim to teach the child new ways of dealing with anger, but also how to reduce the incidence of becoming angry in the first place. They use approved and researched techniques for delivering this information and educating children in communication techniques and how to relieve their frustrations in a better way.The classes also often focus on self-esteem and help build a child’s confidence so they feel more able to cope with stressful or demanding situations without becoming angry. In some cases when there are family implications, it may be possible for the parents to work with the child and the course leaders with the aim of improving family relationships and communication skills and promoting a more positive and social family environment. As our world and the teenagers in it seem to be becoming more violent and less tolerant of each other, parents have been asking the government for help in teaching their children anger management skills and their have been discussions as to whether it would be appropriate to introduce anger management classes as part of the national curriculum. What Can Parents/Carers do to Reduce Their Child’s Anger? Parents and carers are very important in teaching children how to control and manage their anger. First of all they can lead by example and demonstrate on a regular basis that angry outbursts that threaten or intimidate others are not acceptable and that they should be reserved when alone and in a safe place if they occur at all.The parents can also make sure they reinforce the skills and information gained from the anger management classes and allow for continuity in other areas of their life. Parents can help children by being careful what is included in the child’s diet. Foods high in refined sugars can help increase sensitivity and heighten emotions. The sharp fall in blood sugars after eating these sugars can also lead to a sudden change in mood and should be discouraged. Parents can also help young children deal with their anger by having set rules and guidelines within the home. This form of discipline must be specified so that everyone knows the boundaries which must be adhered to with no deviations or exception. This allows the child to know what discipline to expect and how far they are allowed to go before they are taken into check for their behaviour. Anger management classes for kids can be very useful in preventing built up anger from being carried into adult life which has the potential of causing major problems to health and mental state in later years. @Ams - have you seen your doctor? There might be a reason. The main thing you are doing is owning up to the fact and want to seek help (which is so much better than someone who is in denial). By taking ownership of your issues it means you can help yoruself to work out what is causing the problems. Go see your doctor and request counselling and try somehow to get back into education of some sort. Best of luck - you actually sound as if there is a good/nice bloke in there trying to get out. Hi, I’m 14 years old. I’ve got really bad anger issues. I’ve recently gotten kicked out of school well it was 4 months ago because of my anger issues, that resulted in stress and depression which caused my anger issues to get worser. My anger causes me to hit people and hit objects, and it really effects my friendships and my relationships in the family. @Bunks - at least you/his parents are getting medical help. The anger issues may be attributed to something else, such as a health problem. As long as your GP knows he has anger issues then hopefully your GP can look into the possible reasons why. He could have an 'irritable depression' which can manifest itself in children and young adults when they are unable to articulate their feelings. 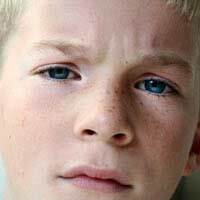 Irritability and anger are also common symptoms of other psychiatric disorders in children, such as ADD, or autistic spectrum disorders. Keep on at the doctors and it may be more than general counselling that is needed. Best of luck. @Sam - have you taken her to see a doctor? You might want to do this if you can't reason with her. If you do suffer from anxiety she might pick up on this, but to be honest you want to nip it in the bud and your doctor might have a solution. Please please help me.... I am at breaking point at the moment. I have a very very angry little girl and i have no idea why. She has just turned 5 and for the past 18months i have been noticing a massive change in her behavour. She is very anrgy towards me and sometime im in tears and want to run away from her as i have noidea what do to. I suffer with anixtey and depression and it is making it 10times worse when she is like this. Its not everyday but when she starts it can be over the slightess things like her sister walking into their bedroom. Please help me. You would have to speak to your GP directly regarding this matter. I am sorry to hear this. The site Child Bereavement may help you link here, to help support your son through these difficult times. You don't say how old the child is and whether the school is aware of his behavioural issues. However, talking an patience will help here. If there is something on his mind that he will not speak of, then this will affect his personality. Likewise, taking him to his GP may also help, if he needs to referred for counselling. Hi. I have a 12years daughter who is very intelligent and creative and academically brave. But the only issue is that she only want things done her own way and the moment she doesn’t get things done way she becomes very angry and when she start she can go on for a very long time. She will eventually say sorry at the end but this has becomes not relevant because it happens all the time. This attitude has now started affecting her school life as she is always having fall out with her friends over a trivia issues. So can I do pleas I need help. Hi I have a son and he will be 7 at this end of the money and he is a very angry little boy. Hewas just diagnosed ADHD back in December but his angry is just getting worse. Even got kicked out of his first game of soccer because he push the boy. His father, grandfather and I even say it that is needs anger management. He has a punching bag that he can punch and kick all he wants he only uses it sometimes. He'sconstantly yelling at people, hitting he'll just walking a room in this punch his brother which is older than he is. When he gets that way I put him on his bed for about 2 min but I'm with him in the same room. He comes down for the time being but if somebody says the wrong thing or teases him or tell him if you hit you will going to be put into jail he gets mad and starts all over again. I don't know what to do!!!!! @lilibub1 If you feel this is a concern you could takl to your GP. If other people close to your daughter i.e her grandparents, aunts and uncles, school feel it's an issue then maybe it's something you should look into before she hits her teenage years. My friend's daughter has terrible anger issues but somtimes parents are immune to their kids faults - everyone else is aware of it but they are too polite to bring it up. My son (13) has got in trouble 3 times for hitting his sister (10) twice. Both times it was because she was annoying him a pushing him. Other times he was be getting told off then he started to shout at me and his mother. Has he got anger issues? Hello, I have a friend that has a lot of anger. She always gets into arguments with her brother and she is always ending up upset and has alwaysbegan to say that she hates her family and her life! I've tried everything to help her but when she gets angry it's just umpossible to talk to her she always talks back and argues. I just want some tips and I want her to be happy with her life! I have an 11yr old son who s anger is getting increasinlyworse he is flying off handle at school and when his temper goes becomes increasingly unreasobable and his account of the situation always different 2 everyone else. He has had counselling and when calm is a lovely sensitive wee boy when in these rages is dangerous and can hear no one round about him and will strike at anyone who gets in his way. I am soworried he is going 2 hurt someone or himself he sometimes cannot remember wot has happened and seems 2 have no control of his emotions. Wot can I do 2 help and manage this ? My son is ten years old and is very angry whenever there is a bit of argument. He is very resistant if he is asked to do anything. He infact abused me yesterday just because he was scolded since he had a argument outside. He is much better behaved if a word is said with love. He is very sensitive as well. Any suggestions would be greatly appreciated. My 13yo daughter is constantly grumpy, always answering back and argumentative. The most worrying thing is the out bursts of violence aimed at her 10 yo brother. These outbursts can range from a simple push to punching and kicking. I am now worried that she may eventually cause him an injury that will result in treatment.Any advice you can offer will be greatly appreciated. It really helps me im on my road to recovory because i really needed help and it worked.